Scoliosis neuroforaminal stenosis is a very common collateral consequence of atypical side-to-side spinal curvature that might eventually or immediately create a pinched nerve. While narrowing of the various neural foramina is normal to experience as a person ages, particularly in the neck and lower back, scoliosis often worsens these structural changes to symptomatic degrees. Neuroforaminal stenosis itself is harmless, as long as the exiting nerve root still has enough space to leave the spine unencumbered. However, if the space tightens up on the nerve causing compression, the patient will likely suffer a range of negative heath effects locally and in the anatomical area served by the impinged nerve root. This focused discussion details the manner in which scoliosis can narrow the foraminal openings and potentially create compressive neuropathy issues throughout the spine. We will examine the consequences of pinched nerves and the best way to treat them in association with a scoliotic causation. The neural foramina are simply spaces that exist in between each vertebral bone. These spaces are maintained by natural design of the human spine, including the shape of each vertebra and the existence of cushioning spacers called intervertebral discs. Both of these factors maintain distance between adjacent vertebrae, creating the neuroforaminal openings. 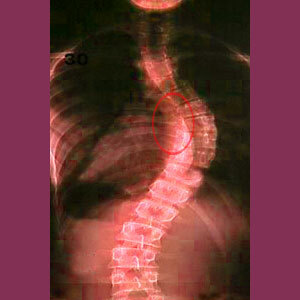 Scoliosis changes the natural alignment of the spine. Instead of vertebral bones meeting at a perfectly straight edge and connecting flawlessly at the facet joints, scoliotic vertebrae meet at angles, which become more severe as the degree of curvature escalates. Therefore, the spine will demonstrate interior (concave – facing into the curve) and exterior (convex – facing away from the curve) aspects of the curvature. The foramen on the interior of the curvature (concave) are likely to be mildly to severely narrowed as a result of the scoliosis. Meanwhile, the formina on the exterior of the curve (convex) are likely to be fully patent or even larger than typical. This makes sense when one observes a diagnostic imaging film of a scoliotic spine and can clearly see how the vertebral edges on the interior of curvature are closer than they are on the exterior of the curvature. It should be mentioned that regardless of the causation, most foraminal stenosis is not symptomatic, nor will it result in a pinched nerve. The neural foramen are more than large enough to allow egress of the tiny nerve root, even when narrowed by as much as 90% or more. To insure a compressive neuropathy, virtually the entire foraminal opening would have to become blocked. While this can occur, it is a rare consequence of most cases of foraminal stenosis. Foraminal narrowing is normal to experience for people with and without scoliosis. It is primarily caused by disc dissection and subsequent arthritic accumulations in and around the neural foramen, including on the facet joints, vertebral bodies and within the central spinal canal. Other structural abnormalities can also contribute to foraminal stenosis, including herniated discs, spondylolisthesis, atypical kyphosis or lordosis and scoliosis. Most often, symptomatic versions of foraminal stenosis happen due to a collateral combined effect of multiple narrowing processes working together to finally create a compressive neuropathy condition. You can read all about the many causes of neuroforaminal stenosis in a focused topical resource section on Spinal-Stenosis-Treatment.Org. Foraminal stenosis itself will never cause any symptoms unless it actually compresses the exiting nerve root. If a pinched nerve does occur, it may resolve organically, or might worsen, potentially requiring professional medical intervention, depending on the source process of stenosis. Intervertebral disc related symptomology tends to resolve without intervention, while curvature-related and arthritic stenosis tend to necessitate treatment. True pinched nerves typically begin with pain locally and at the destination of innervation. Tingling might also be present. Within a short timeframe of days to weeks, the nerve will lose signaling ability and the area will not be painful anymore, if actual pain was ever present. Instead, the patient will suffer progressive paresthesia and weakness in the innervated area of the body served by the compressed nerve. They will eventually suffer sensory, autonomic and/or motor deficits in the bodily locations and systems innervated by the affected nerve root. Chronic pain is not a typical or logical symptom of a pinched nerve, explaining our stance on why so many of these compressive neuropathy conditions are grossly misdiagnosed. Generally, in non-scoliotic patients, true foraminal stenosis enacting a symptomatic pinched nerve might benefit from several effective treatment options. While symptom-based treatment is common, it will generally not relieve the underlying compression issue, unless the body heals itself organically, such as when an inflamed bulging disc calms with time. However, there are still several options for curative care that can solve most foraminal stenosis problems. Spinal decompression offers a great noninvasive solution for disc-related foraminal narrowing. 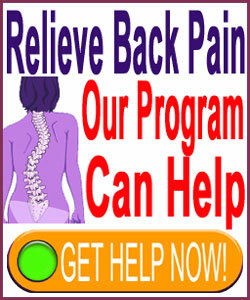 The therapy can resolve disc herniations and bring about lasting relief form pinched nerve symptoms. Minimally-invasive surgery can be used to resolve a host of possible causes and contributors, with foraminotomy, laminectomy, discectomy and other procedural options allowing the patient to achieve a complete recovery from a pinched nerve. However, in scoliosis patients, the curvature might be a significant contributor to the foraminal stenosis. Therefore, unless that curvature is addressed, the usual treatment paths become more complicated and usually less effective. This is not the say that they do not work, but the procedures might become more invasive and might require the removal of more bony material to clear the foramen. In these cases, the spine might become unstable and require reinforcement via spinal fusion. Of course in very severe curvatures that result in multiple compressed nerves and severe general spinal stenosis, a large scale fusion might be attempted to correct the curvature and resolve the full range of symptoms at once. Although this sounds great, the type of fusion used is functionally-affective, dangerous and filled with potential complications, making it a viable option for only the very worst cases of pathological scoliosis care.